I went out to the Quinapoxet for the first time yesterday. I had heard very good things about it so I decided to try there since some of the larger rivers were still blown out. The first spot I tried looked really nice with ample pocket water and very "trout" pools and runs. Unfortunately, fishing was a little on the slow side as I was only able to find fish in one pool. 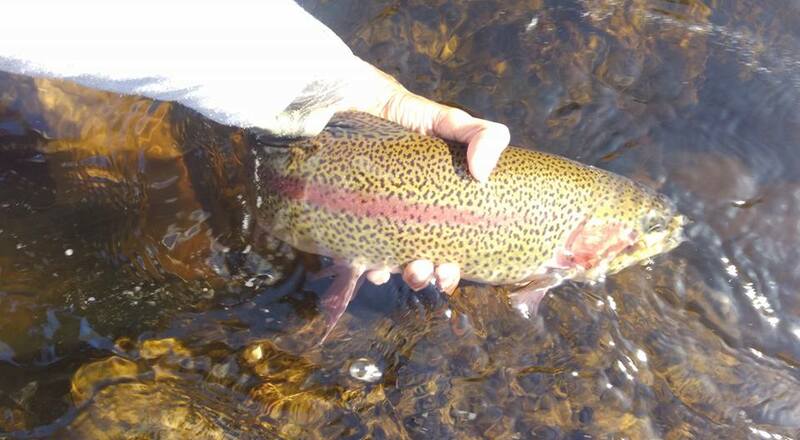 I landed two rainbows and missed a few more, including a huge fish that broke me off, but that was it for action. One of the bows was a 10 in stockie but the other was substantially larger. It didn't put up much of a fight and came to hand fairly quickly. But man was it beautiful! It was completely covered in spots but I wasn't able to get a great photo since I dropped my phone in the water trying to land the fish. My phone is waterproof so it was okay but wet lenses and good photos don't often go hand in hand. I let it go but it swam away slowly; either it had been hooked a fair number of times or it was just too warm out. In general, I was surprised at the lack of fish in the river since I didn't catch any creek chubs or shiners to pass the time. I decided to try another popular stocking point to try and catch some of the brookies and browns they stocked a couple days ago. Unfortunately, this spot didn't produce at all and I got more bug bites than fish (mosquitos and black flies were horrible last evening). I talked to a spin fisherman on the way out who reported no success so I knew it wasn't just me. Disappointed, I left to make it home for dinner. I checked the USGS website when I went home and saw that the water temperature in the Q went up to 70 ˚F. While this is certainly tolerable for bows and browns, it is on the upper end for brookies and might have explained why the fish were so sluggish and unwilling to bite. Overall, my first impression of the Quinapoxet was mixed. While it has potential due to the amount of awesome looking holding water, it seems like it will be better in April or in the Fall since it seems shallow and small enough to warm significantly in the summer. It certainly wasn't as good as I thought it would be but this trip might have been an exception rather than the rule. Maybe I'll have to try again early in the morning? If anyone has fished this spot and would like to give me pointers, I'd appreciate it. Thanks. Note: I just wanted to clarify from my last post that I don't want to ban bait in my highlighted rivers. I just want stricter regulations and smaller bag limits. I've heard stories of poaching where people leave with garbage bags full of trout and I consider that wrong. I feel that lowering bag limits in large rivers is a step in the right direction to eliminate poaching.